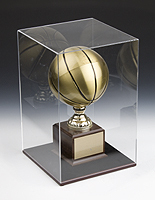 These Tabletop Trophy Cases Made From Acrylic Are In Stock and Ready To Ship Today! Purchase These Clear Countertop Holders With Confidence From Our Online Catalogue! Common Size (w x h x d): 10" x 10" x 10"
Translucent finish easily blends into any environment. Comes with a riser for displaying round items. Affordable way to display collectibles while keeping them safe from mishandling. These display cabinets are not only used to treasure valuables or collectibles. These products can also be used to showcase various other items or accessories. 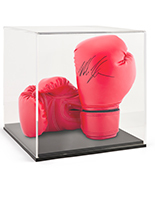 These countertop showcases, trophy cases are the perfect choice for keeping collectibles with an autograph safe and protected for many years. 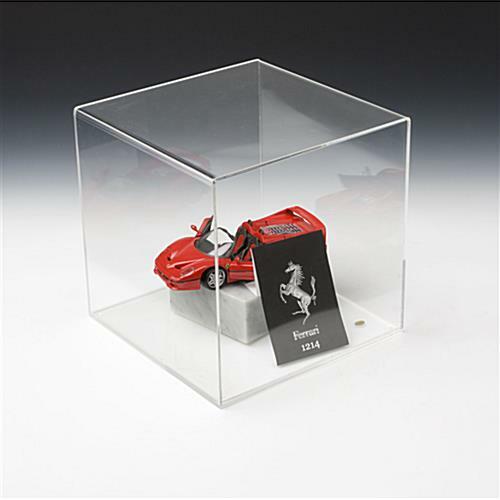 Featuring an open top lid, each acrylic cube showcase permits fast and easy access to the displayed items. Simply lift off the top of the trophy cases, place the object on the base and cover with the lid. These countertop showcases for collectibles feature a simple design, making them perfect for use within any setting. These football displays, trophy cases are generally seen used in museums, schools, homes, libraries and retail stores. 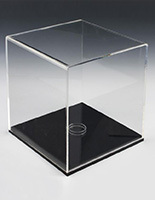 These countertop acrylic holders, display cabinets are designed to present a variety of items. 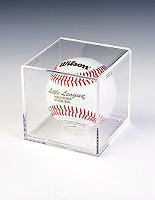 This product can be used to showcase items such as autograph basketballs, model cars, jewelry, antiques, and other types of sports displays. These collectibles displays, trophy cases are beautifully constructed from 1/8" thick acrylic for durability, ensuring these retail store fixtures will last for a long time. 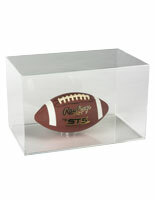 These football showcases give a clear view of the displayed items, and are great for placement on a countertop. 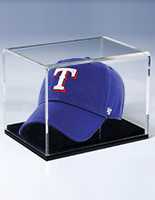 Retail stores often use these trophy cases on their counters to showcase individual items, such as a jersey with an autograph. 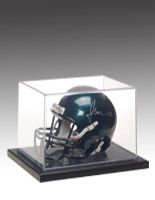 Stores selling sports memorabilia also find these display cabinets useful, as they can safely showcase collectibles item on a countertop or a shelf for customers to see. These trophy cases, like basketball holders, include a removable acrylic riser included for displaying any round objects. Users can also remove the round ring from the football cases to hold flat-base items as well. 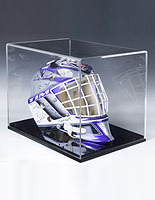 Items with a sports player's autograph instantly become collectibles, and should be stored in a safe place, such as within these trophy cases. 10.1" x 10.3" x 10.1"
9.9" x 10.0" x 9.9"